Whale! What a truly epic nail biter the 2008 F1 Season Finale was, eh? As a long time fan of Herr Schumacher’s, a.k.a. Michael Schumacher, the brother of “Vurld” famous Ralfanso, I’ve been a devoted Tiafosi since the German departed my previous favourite Formula One team Benetton, way back in 1995. Thus being devoted to the Scuderia since the last BLOODY Bloke from Jolly ‘Ol England; Damon Hill finally defeated his arch nemesis “Schuey” behind the wheel of Sir Frank’s Williams-Renault, I recall having cast squared jaw “Brit” David Coulthard as one of the enemies during the Schumacher reign, (Of terror?) while “Jense” (Button) was touted as the new British hope upon his arrival in Formula 1. And since 2002, I’ve fondly thought of the phrase; “Immer Ferrari,” when Mary Ellen asked the neighboring “huns” at the Nurburgring who’d they’d root for after Schuey had retired. And believe me, I’m NO talent spotter, but the driver that most garnered my attention was a very young 21yr old Fin, by the name of Kimi Raikkonen way back in 2001 when he made his rookie debut driving for Peter Sauber’s privateer outfit. Thus, it was logical that I’d take up rooting for the Iceman when he somewhat acrimoniously took over Michael’s seat at the Scuderia for the ’07 season, which miraculously saw Kimi go on to become World Champion in Brazil by the narrowest of margins. Another driver “pick” of mine, was the mercurial Brazilian Felipe Massa, having also been suitably impressed by his driving at Sauber, then going off to become a Ferrari test driver before returning for a second stint at the Hinwil based outfit and then picked as Schumacher’s teammate at Ferrari for ’06, when “Rubino” left to challenge for the title with Honda. And although we didn’t get to have any free crème soda’s while exiting the media center that hot July afternoon, (Danny) one of the coolest things in regards to Felipe, was getting to watch him taking part in the live interview at Indianapolis in ’06, when via close circuit TV, we got to witness the top three post race interviewee’s talking live in their native tongue’s, as race winner Michael Schumacher prattled on in Deutch, with Felipe in Portugese and third place Giancarlo Fisichella in Italian. But, I’ve enjoyed watching how all of these drivers have developed, as I recall vividly how Kimi learned how to do the Schuey “Squeeze,” after Michael had forced him wide at Magny Cours in ’02 enroute to his record tying fifth World Championship, as Kimi would return the favour to Juan Pablo Montoya, while young “Louise Jaguar” Hamilton, seems to have learned similar lessons this season. 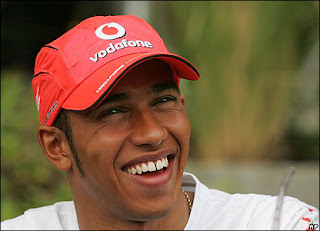 And thus, I was even more spellbound when it was announced that it was the young Messer Hamilton who’d be named the 2008 F1 Driver’s Champion instead, having come out of nowhere in the appalling conditions to grab the title by the single point that he’d given away last year! Best race of the year by far and one that Lewis will never forget, nor will I! I've been a huge fan of MB/Mclaren for some time now and its nice to see them back at top! FU Ferrari and Massa, you didn't deserve it. Your fathers look of surprise when he found out you didn't win was priceless! My statement about not deserving it, it refers to Ferrari's power in the F1 community. They have the ability to control races, and manipulate a council to put them in favor. Maybe its also the fact I don't like how Ferrari had something to do with removing Montreal off the schedule for the coming years. Why I wonder? Oh maybe its the billion dollar ferrari facility they built in Abu Dhabi!!! I smell paid off politicians and businessman! Speed claims IRL is Boring!